England all-rounder Ben Stokes says he is "extremely delighted" to be available for the tour of New Zealand. Stokes, 26, has not played since an incident outside a Bristol nightclub in September and has been charged with affray. The hearing will be at Bristol Magistrates Court on 13 February. Earlier on Wednesday, the England and Wales Cricket Board announced it would consider Stokes for selection again. "Can't wait to get back out with the Three Lions on my chest," he tweeted. "Representing my country is one of the greatest things that I've ever been lucky enough to do, walking out on to the field with the England shirt on is a privilege and a honour. "I'm extremely delighted to be given this opportunity to do this again." The Durham cricketer will join the squad for the second half of the triangular Twenty20 series in New Zealand in February. England then play five one-day internationals and two Tests against the Black Caps. Stokes intends to contest the affray charge and it remains unclear whether he is required to attend the 13 February hearing - which falls on the same day as England's T20 International against New Zealand in Wellington. He would be required to attend unless his solicitors make a request to the court to have the case put back to a new date and the court is satisfied with their argument enough to do so. 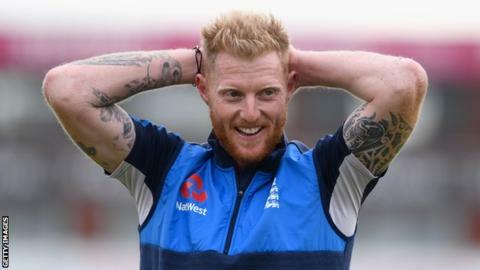 The ECB said that, "given the potential length of time to trial", it would not be "fair, reasonable or proportionate for Ben Stokes to remain unavailable for a further indeterminate period". Stokes missed two one-day internationals against West Indies in England last year and the entire winter Ashes Test series in Australia. He will play no part in the current one-day series against Australia. However, the ECB allowed him to play six matches for Canterbury Kings in New Zealand domestic cricket in December. An ECB statement read: "ECB fully respects the legal process and the player's intention to defend himself against the charge. "England selectors, management and players have been informed and Ben Stokes is expected to join the squad in New Zealand for February's T20 matches." Alex Hales, 28, who was with Stokes at the time of the incident, was not arrested but was interviewed under caution by police. He was told in December that he would face no criminal charges. Two other men - Ryan Ali, 28, and Ryan Hale, 26 - were also charged with affray this week. No firm date has been set for Stokes to return but, subject to any further legal developments and he's yet to make his first court appearance to face a charge of affray, he'll face New Zealand in February's T20 series prior to the two Tests in March. Clearly the legal process will take its course and it remains a possibility that Stokes will have to leave the tour if necessary. 25 September - Stokes and team-mate Alex Hales are involved in an incident at about 02:35 BST near Bristol's Mbargo club which left another man needing hospital treatment for facial injuries. Stokes is arrested by Avon and Somerset Police and released under investigation. 27 September - England include Stokes in their 16-man Ashes squad, despite him suffering a minor finger fracture on his right hand. Hales is not included. 27 September - The Sun newspaper releases footage that allegedly shows the incident involving Stokes and Hales. 28 September - The ECB announces Stokes and Hales will not be considered for selection for England matches until further notice. 11 October - Stokes loses his sponsorship deal with sportswear brand New Balance. Stokes apologises to Katie Price and her disabled son Harvey for a video that showed him imitating a TV clip of the youngster. 28 October - England fly out to Australia for the Ashes without Stokes. 23 November - England lose the first Ashes Test against Australia by 10 wickets in Brisbane. 29 November - Stokes arrives in New Zealand to play for Canterbury Kings. 29 November - Avon & Somerset Police announce they have completed their investigation and have sent their findings to the Crown Prosecution Service. 4 December - It is announced Hales will not face criminal charges, and the ECB says he is available for selection. 6 December - Stokes is named in England's one-day squad for the five-match series against Australia in the new year. 23 December - Stokes ends his spell with Canterbury and returns to England. 11 January - Stokes is named in England's Test squad for the tour of New Zealand in March and April. Check out the BBC Sport Live Guide for details of all the forthcoming live cricket on the BBC.